Four wicked young men in Ikirun, in Ifelodun local government area of Osun State have murdered a Lagos based businessman, Victor Akingbile who was also an indigene of town. 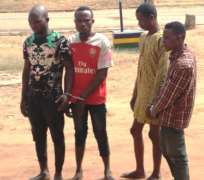 The suspects, Rasheed Waheed, Kayode Sunday, Hammed Rafiu and Owolabi Basiru kidnapped and killed Victor after taking ransom. The suspects confessed that after receiving the money from Victor's account, they lucked him in the booth of his car, drove the car to a secluded place and burnt him with the car. The Nigerian Voice gathered that the 48-year-old businessman was in Osun to see his parents but he was wasted on November 26th by the heartless individuals. When Victor could not be found for few days, his friends became curious and reported the matter to police at Dugbe Divisional Police station in Osogbo after which the matter was taken to the police headquarters in Osogbo. The Commissioner of police in the state, Mr Fimihan Adeoye detailed the Police Special Anti-Kidnapping Squad to handle the case and get to the root of the matter. In the course of investigation, police detectives discovered that N3 million was transfered from Victor's account within the period of his visit to Osun. The account of the recipient of the money transfered from Victor's account was scrutinized and it led to the arrest of several suspects. The suspects are all indigenes of Ikirun but they live in different locations in Lagos and Ondo states while only one of them, Owolabi lives in the town. CP Adeoye said the suspects would be charged to court and assured that they would face the full wrath of the law. Adeoye commended the anti kidnapping squad for the swift action in apprehending the suspects.